If you’re like us, you’re pretty excited about how well Kentucky is doing this season. New coach, new style, new successes – the Cats are finally back. If you’re a Cats fan, we’ve created something just for you. 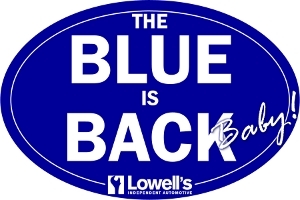 A 4×6″ Kentucky blue oval car magnet inscribed with “The Blue is Back, Baby!”, it is designed to help you cheer the Cats to victory. They’re free to Lowell’s customers. You can get extras for $5 per magnet, with all proceeds going to the American Red Cross for earthquake relief in Haiti and Chile. Show your pride in your team. Pick one up at Lowell’s today!